This mock wrap top features black flexible knit side panels that instantly slim (White has white knit side panels), double-needle stitching, flatlocked seams at knit panels, two front roomy patch pockets with WonderWink signature utility pocket, secret mesh pocket in pocket, and tagless neck. Center back length: 27¾". 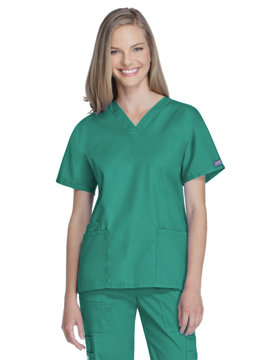 This v-neck top features five pockets total (two lower pockets including one WonderWink signature triple pocket with a hidden mesh pocket), signature ID bungee loop, and invisible three part accessory loop. Center back length: 27¾". 5-pocket tie front pant with elastic back. Regular inseam: 31½". Petite inseam: 29½". Tall inseam: 33½". A dolman sleeve, v-neck tunic with side seam vents, two patch pockets and a cell phone pocket. Center back length 26½". 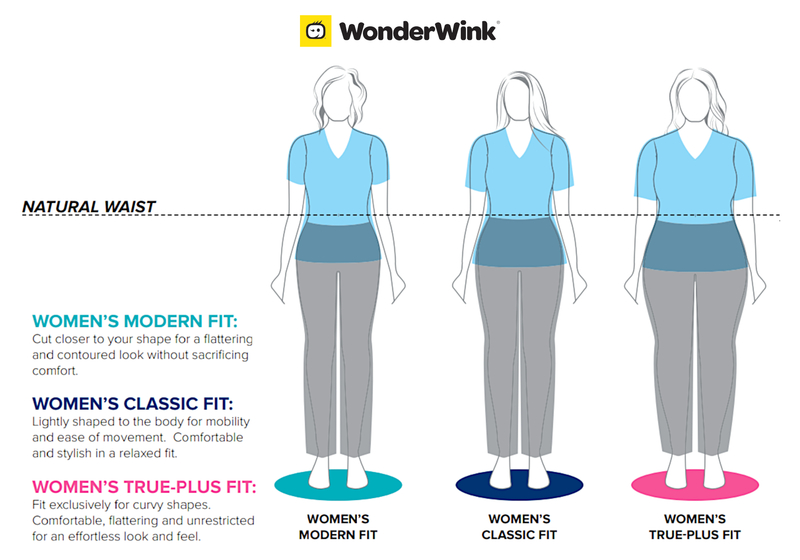 A modern classic fit, mid rise, straight leg pant featuring a comfort-fit knit waistband reinforced with inside elastic for extra support. Also featured are front patch pockets, a cargo pocket, logo label with bungee loop, back pocket, knee seams and side vents. Regular inseam: 31". Petite inseam: 28½". Tall inseam: 34".